What is unique about how Neptune was discovered? 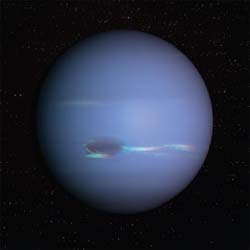 Neptune is the first planet whose existence was predicted mathematically and then observed afterward. Soon after William Herschel discovered Uranus in 1781, astronomers measured a strange anomaly in its orbit, almost as if a massive object even more distant that Uranus itself were occasionally pulling on the planet. The German mathematician Karl Friedrich Gauss (1777–1855) made calculations based on these planetary movements that laid the groundwork for the discovery of another, more distant planet. In 1843, a self-taught astronomer named John Couch Adams (1819–1892) began a series of complicated calculations that pinpointed the location of such a planet; he finished the calculation in 1845. In 1846, a French astronomer named Urbain Jean Joseph Leverrier (1811–1877) also made a determination of this planet’s location. The calculations of Adams matched those of Leverrier, though neither knew of the other’s work at the time. On September 23, 1846, Johann Galle (1812–1910) and Heinrich d’Arrest (1822–1875) at the Urania Observatory in Berlin, Germany, found this planet based on the calculations of Leverrier, confirming the findings of both men. Neptune’s distinctive blue color is caused by a combination of helium, hydrogen, and methane in its atmosphere.